The all-new compact car series from Mercedes, the Mercedes Benz B Class 2012, will premiere at the Frankfurt Auto Show 2011 in September and will enter the UK market in March 2012. The new B-Class is a typical Mercedes sports tourer, offering plenty of space combined with impressive dynamic performance as a hatchback saloon. The character lines of the exterior design indicate both of these attributes: the front and rear feature width-emphasizing design, with a wide, prominent grille and headlamps extending along the sides at the front while the rear end features a wide rear window, two-piece tail lights and a large tailgate with low loading sill. Substantially more agile and efficient, but as comfortable and spacious as ever – the new B-Class from Mercedes-Benz is a winner on all fronts. The vehicle's lower height and more upright seat position provide for a first impression that hints at the compact sports tourer's dynamic credentials. With a new four-cylinder petrol engine featuring direct injection and turbocharging, a new diesel engine, a new dual clutch transmission, a new manual transmission and new assistance systems, the front-wheel-drive car also rings in a new technological era for compact cars from Mercedes-Benz. "No model change in the history of Mercedes-Benz has ever seen so many new developments introduced in one fell swoop," stresses Dr. Thomas Weber, Member of the Board of Management responsible for Group Research and Head of Development, Mercedes-Benz Cars. "Future B-Class customers will benefit from this quantum leap in terms of better fuel consumption and lower CO2emissions combined with driving pleasure, plenty of space and the highest standard of safety that has ever been available in this class." The world premiere of the new B-Class (length/width/height: 4359/1786/1557 millimetres) will take place at the Frankfurt International Motor Show (13 to 25 September 2011). It will be making its way to the UK in March 2012 . The new B-Class is a typical Mercedes sports tourer, offering plenty of space combined with impressive dynamic performance as a hatchback saloon. The character lines of the exterior design indicate both of these attributes: the front and rear feature width-emphasizing design, with a wide, prominent grille and headlamps extending along the sides at the front while the rear end features a wide rear window, two-piece tail lights and a large tailgate with low loading sill. The new sporty lines and the outstanding aerodynamics are particularly evident in the side line: the bonnet flows seamlessly into the A-pillar and the roof line descends sleekly to the striking roof spoiler. The roof features a contoured line which lends the vehicle a longer appearance. The pronounced wheel arches offset by dynamic feature lines under the beltline are a sporty interpretation of the current design line from Mercedes-Benz. The bottom edge of the body features dynamic side skirts which add a light touch to the vehicle's appearance. Refined details such as the exquisitely designed headlamps with the new spotlight element confirm the brand's unmistakable premium credentials which shine through in the compact segment, too. An outstanding drag coefficient of cd= 0.26 places the new B-Class at the forefront of its market segment. As well as the aerodynamic exterior design, numerous optimisation measures on points of detail such as the air flow around the front wheels, the underbody design and the cooling air flow are also crucial contributory factors to this excellent aerodynamic performance. Patents are pending for innovative details such as the serrated wheel arch spoiler. The new vehicle concept underscores the dynamic aspirations of the new B-Class. The most striking aspect is the reduced height: at 1557 millimetres, the new model crouches almost five centimetres lower on the road than its predecessor. The seat height in relation to the road has also been reduced (minus 86 mm) in order to facilitate getting in and out of the car easily, while maintaining a clear overview of the vehicle's contours when driving. In response to requests from many customers, the sitting position is more upright, however. At the same time, the headroom has been further improved. With maximum headroom of 1047 mm at the front (without sliding roof), the B-Class is among the most spacious cars in its segment in this discipline, too. The ergonomically expedient more upright sitting position in combination with a lowering of the vehicle's floor at the rear leads to a segment-leading degree of legroom (976 mm) which even surpasses that of the S- and E-Class. The B-Class is optionally available with the EASY-VARIO-PLUS system. This enables simple reorganisation of the interior so as to enable the transportation of bulky items. Features of the EASY-VARIO-PLUS system include fore/aft adjustment of the rear seats by up to 140 millimetres (thereby increasing the luggage compartment volume from 488 to 666 litres) and a front passenger seat whose backrest can be folded forward onto the seat cushion. High-quality materials and finely structured surfaces, stylish details, precision workmanship and a new spaciousness – the interior of the B-Class defines a whole new benchmark in the compact segment. Many features have been the reserve of higher classes of vehicle to date and embody Mercedes-Benz's special definition of quality and aesthetics. The dashboard is optionally available in ARTICO man-made leather finish and features stitching, for example. Four equipment packages (Chrome, Sports, Exclusive and Night package) enable individualisation according to personal tastes. On the inside the large, three-dimensional trim covering the entire dashboard first strikes the eye. It is available in four variants, covering a broad spectrum from modern through sporty to classic. Common to all versions is a high-class appeal combining an attractive look and feel with easy care and durability. The three large round vents in the middle and their uniquely designed cruciform nozzles add a sporty attribute to the interior's emotional design idiom. The display, which is available in two sizes (5.8- and 7-inch) appears to hover over the vents. With its stylish design – the trim frame with galvanised finish contrasting with the piano black of the front panel – and slender lines, the colour display (TFT) is a highly attractive feature in the cockpit. The 3-spoke leather trimmed steering wheel, which always incorporates a silver chrome insert in the middle spoke, the instrument cluster with four analogue round dials and suspended pointers in the 6 o'clock position and the seats with contrasting stitching underscore the sporty character. 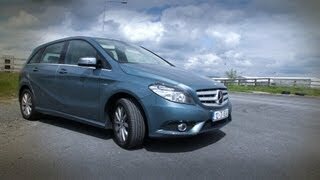 The new B-Class features new petrol and diesel engines as well as new manual and automatic transmissions. All transmissions and engines have been developed in-house, with production taking place at the plants in Stuttgart-Untertürkheim and -Hedelfingen, Rastatt/Baden, Gaggenau/Baden and Kölleda/Thuringia. The simultaneous development process enabled perfect coordination of engines and transmissions, e.g. with regard to implementation of the ECO start/stop function which features as standard on all B-Class models. Common features of the new drive systems are the use of state-of-the-art technologies for maximum efficiency, very smooth running, high tractive power right from low revs, sustainability in terms of impending emissions standards and low weight. For the purposes of transverse installation the engines, all of which are turbocharged, and the two transmissions are very compactly designed, providing the B-Class with an exemplary small turning circle for a front-wheel drive vehicle of eleven metres. The engine and transmission suspension consists of a four-point mounting system comprising engine mount, transmission mount and two self-aligning supports. This suspension system has been designed specifically to meet the requirements of the high-torque engines with regard to minimum noise levels. The hydraulic damping integrated in the transmission mount is a key contributory factor to the exceptionally high ride comfort. The new four-cylinder petrol engines (internal designation M270) mark the launch of a completely new engine series. The combustion process is based on the third-generation Mercedes-Benz direct injection system which was introduced last year with the BlueDIRECT V6 and V8 engines. 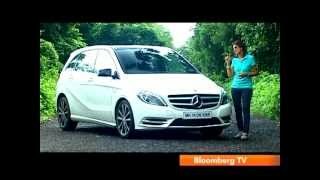 Its use in the B-Class marks this technology's debut in the compact segment. The new four-cylinder engines have been designed for both transverse and longitudinal installation. In the new B-Class they are initially available with a displacement of 1.6 litres, as the B 180 rated at 122 hp and the B 200 with an output of 156 hp. Their maximum torque of 200 and 250 Nm respectively is available from an engine speed of 1250 rpm. The new four-cylinder diesel engine is a further development of the OM651 deployed in the C- to the S-Class, a common rail direct-injection engine of the third generation. With its displacement scaled down to 1.8 litres and numerous optimised points of detail, this is the first time that the compression-ignition engine has been mounted transversely in a Mercedes-Benz car. The B 180 CDI generates 109 hp of power, while the B 200 CDI has an output of 136 hp. The maximum torque stands at 250 Nm from 1400 rpm for the 80 kW variant and 300 Nm from 1600 rpm for the 100 kW variant. Another Mercedes-Benz premiere is the new 7G-DCT dual clutch transmission in the B-Class. This transmission is extremely compact, extremely variable with regard to adaptation of the engine speed thanks to seven gears, features an electric oil pump for start/stop capability, shifts gear without any interruptions in tractive power and combines the comfort of an automatic with the efficiency of a manual transmission. The new 6-speed manual transmission designed along similarly compact lines as a three-shaft transmission is a close relative of the DCT. Extremely easy gear shifting, low shift forces, low internal friction and a low weight are among its most important characteristics. "Fantastically agile" is the assessment of all test drivers who have put the new B-Class through its paces to date. Three factors are instrumental to the substantially enhanced dynamic performance in comparison to its predecessor, which does not come at the cost of any compromises on comfort: the lowered centre of gravity, the new four-link rear axle and the upgraded ESP®Electronic Stability Programme. A sports suspension is optionally available for further enhanced agility. The centre of gravity has been lowered by a further 20 mm and the suspension additionally features sports dampers with amplitude-selective damping and a Direct-Steer system will be standard on the Sport model line. The electromechanical steering of the B-Class has been redesigned. The electric motor of the servo assistance system is now located directly on the steering gear as a dual pinion EPS system, thereby optimising the package as a whole. The steering ratio becomes noticeably more direct at greater steering angles, enhancing the vehicle's handling and agility substantially. The electromechanical steering system makes an important contribution to the vehicle's overall efficiency, as the steering assist function only requires energy when steering actually takes place. As a world first in the compact segment, the B-Class features a radar-based collision warning system with adaptive Brake Assist as standard, which lowers the risk of rear-end collisions. The COLLISION PREVENTION ASSIST system outputs a visual and acoustic warning to alert a possibly distracted driver to identified obstacles, and prepares Brake Assist for the most precise possible braking response. This is initiated as soon as the driver emphatically operates the brake pedal. In contrast to systems currently on the market in the compact class, the new COLLISION PREVENTION ASSIST brake assist feature is not merely a system intended to minimise minor damage in urban traffic. Rather, this innovative solution is aimed at protecting motorists from typical rear-end collisions in dangerous traffic situations. Mercedes-Benz expects the new safety system to have a significant positive effect on accident statistics. The PRE-SAFE®preventive occupant protection system which features in the B-Class is available for the first time in this vehicle category. This represents a further step in the ongoing implementation of this innovation, which was premiered in the S-Class in 2002. Core features of PRE-SAFE®are reversible belt tensioning, the closing of side windows and sliding sunroof in case of critical lateral dynamics and adjustment of the fully electric front passenger seat with memory function to an ideal position for maximum effectiveness of the restraint systems. PRE-SAFE®is always activated in response to critical longitudinal and lateral dynamics and may also be triggered upon intervention by certain assistance functions. The scope of restraint facilities takes special account of the B-Class' use as a family car. Great importance has been attached to the safety of the rear occupants. Belt tensioners, belt-force limiters and belt height adjusters come as standard on the outer seats. Rear sidebags are optionally available. Integrated child seats and automatic child seat recognition are available as in the predecessor. Driver and co-driver are provided with new pelvis bags which are able to cover the pelvis and the entire upper part of the body. For head protection, a windowbag is fitted as standard. Internet access, the convenient LINGUATRONIC voice control system, two navigation solutions tailored to different budgets, connection for mobile audio devices and an intuitive operating concept – the information and communication systems in the B-Class offers excellent user-friendliness and a superior level of functionality which has been the reserve of higher categories of vehicle to date. It is the new multimedia generation from Mercedes-Benz which delivers these standards. The operating concept featuring the turn/push control in front of the armrest and the control knob on the head unit is also familiar from other Mercedes model series. The COMAND Online multimedia system offers internet access. Customers can either surf the web as they wish while the car is stationary or call up a Mercedes-Benz app whose particularly fast page loading and simple operation make it suitable for use while driving. Integrated apps include Google™ Local Search and Weather, and the facility for downloading a route which has previously been configured on a PC using Google Maps and transmitted to the car. The modular "Energy Space" concept means that the new B-Class is already designed to accommodate versions with an alternative drive: appropriate interfaces in the body shell enable the main floor panel to be modified and a step to be produced for the versions with alternative drive. An underfloor compartment covering part of the area under the rear bench seat offers space for alternative energy accumulators.